Joe has led the Cubs to the postseason in each of his first three seasons at the helm, including consecutive N.L. Central Division titles and the 2016 World Series, the franchise’s first championship in 108 years ... the 2015 N.L. Manager of the Year, he was named the 54th manager in Cubs history, November 3, 2014, replacing Rick Renteria ... the 2018 campaign is his 44th season in pro baseball, his 25th at the major league level and 13th as a major league manager. © Is a three-time BBWAA Manager of the Year award winner, having earned the honor in 2008 and 2011 with Tampa Bay, and in 2015 with the Cubs. w Is one of only seven managers (and two currently active) to win the award at least three times, joining Tony La Russa (four times), Bobby Cox (four), Dusty Baker (three), Jim Leyland (three), Buck Showalter (three) and Lou Piniella (three). w Is the sixth manager (and just the second active) to win the award in both leagues, joining La Russa, Cox, Leyland, Piniella and Bob Melvin. © Is one of only three managers in major league history to go to the postseason seven or more times and not play in the major leagues, joining Hall of Famers Joe McCarthy (nine times) and Jim Leyland (eight). © Is the first Cubs manager to lead the team to three-straight post-season appearances since Frank Chance did so from 1906-08. © With 97 victories in 2015, Joe set the Cubs franchise record for most wins in a manager’s first year with Chicago, surpassing Jim Frey’s 96 wins in 1984. © Joined Chicago following nine seasons (2006-14) at the helm of the Tampa Bay Rays ... led Tampa Bay to four post-season appearances (2008, 2010, 2011, 2013) ... helped the Rays to the American League pennant in 2008. © Created Thanksmas in 2006, a program that has turned into a week-long event in which Joe and numerous volunteers serve meals and provide gifts to needy citizens throughout the Tampa Bay area. © The Tampa Bay Sports Commission in June of 2012 named him the Tampa Bay area philanthropic player or coach of the year. © In November 2012, he received the Ted Williams Award from the Pediatric Cancer Foundation for making a difference in the community. © In December 2011, Maddon introduced his Hazleton Integration Project (HIP), created to help develop and maintain an atmosphere that will serve to unify the varied cultures of his Hazleton, Pa., hometown. w In June 2013, HIP opened its Hazleton Community One Center … since then, more than 1,000 people (mostly children) from the Hazleton area signed up for a variety of classes and activities … the center features over 30 programs as diverse as basketball camps, archery lessons, arts and crafts, guitar instruction and family yoga … Joe has worked closely with the Board of Directors of HIP to ensure the Center will be able to serve the needs of the economically disadvantaged. © Received his honorary degree from Lafayette College (Easton, Pa.), September 2, 2010 … was inducted into Lafayette’s Hall of Fame in November 2009.
w Played three years of varsity baseball and one season of freshman football … was recruited by Lafayette as a shortstop and pitcher but switched to catcher midway through his freshman season when he volunteered despite having never caught before. © On May 12, 2009 was honored at the Pennsylvania State House of Representatives … the House unanimously voted in favor of H.R. 303 highlighting Maddon’s accomplishments on the baseball diamond and his continued ties to his hometown of Hazleton, Pa. … Hazleton (population: 25,000) is located approximately 80 miles north of Philadelphia. 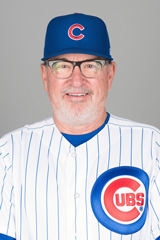 Joe has guided the Cubs to three-straight postseasons, and in 2016 led the organization's first World Series title since 1908 ... has amassed 292 regular season victories in his first three seasons with the Cubs ... managed Tampa Bay for nine seasons from 2006-14, and owns an 1,073-922 all-time managerial record, including two interim stints with the Angels in 1996 and 1999. © Is the first manager to lead Chicago to three-straight post-season appearances since Frank Chance did so in 1906-08. © Is the first Cubs manager to lead the team to consecutive division titles since Lou Piniella in 2007-08. © Recorded his 1,000th career managerial victory May 16, 2017 vs. Cincinnati. © Chicago's 103 regular season wins in 2016 were the franchise's most in 106 years since the 1910 club went 104-50. © In 2015, guided the Cubs to 97 regular season wins and a trip to the NLCS ... the 97 victories set the franchise mark for most wins in a manager's first year with Chicago, surpassing Jim Frey's 96 wins in 1984. © Has managed clubs to 90 regular season wins eight times, all coming in his last 10 seasons ... that includes each of his first three seasons with the Cubs ... guided the Rays to five 90-win seasons. © Prior to joining the Rays as manager in 2006, he spent all 31 years of his professional career in the Angels organization, including the final 12 on the major league coaching staff. © Served as the Angels bench coach for most of his final 10 seasons in Anaheim, including the final six (2000-05) under manager Mike Scioscia - the team went 520-452 (.535) in that stretch ... the Angels went to the postseason three times and won the World Series in 2002. © Spent 12 years at the minor league level as a manager or instructor before his promotion to the Angels major league staff as bullpen coach on May 17, 1994 … began that season as the Angels director of player development and was in his third year as the club’s minor league field coordinator before the promotion. © Moved to first base coach in 1995 and in 1996 served as bench coach, first base coach and interim manager when John McNamara, then interim skipper, was sidelined with deep vein thrombosis (blood clot) in his right calf … posted an 8-14 record. © Replaced Terry Collins as skipper in 1999 after Collins resigned on September 3 … posted a 19-10 record as the interim manager … also replaced Collins in 1998 when the Angels manager was suspended eight games due to bench-clearing incidents, June 2 at Kansas City. © Began his managerial career with Single-A Idaho Falls in 1981 … earned Northwest League Manager of the Year the following season when he guided the Single-A Salem Angels to the league championship … returned to Salem in 1983 before moving on to Single-A Peoria in 1984 … managed the next two seasons (1985-86) at Double-A Midland of the Texas League … served as the organization’s roving hitting instructor from 1987-93. Joe batted .267 (137-for-514) with 27 doubles, two triples, five homers and 69 RBI in 170 minor league games spanning four seasons after he was signed by the Angels as a free agent catcher in 1975. © Hit .294 (48-for-163) in his first pro season with Single-A Quad Cities in the Midwest League. © Played for Single-A Salinas in 1977-78 and Santa Clara in 1979 before moving to scouting and managing.